This most charming family home is located on one of the loveliest tree-lined streets surrounded by the elegant homes in Presidio Heights. The expansive parcel is graced by stately trees, colorful perennials, seasonal blooms and brick pavers. The façade is reminiscent of a gracious French manor house with its pale grey shingles, multi-paned leaded glass windows & dormers which intersect the steep hip roof line. The interior architecture found throughout the residence features impressive ceiling heights with deep crown molding and tall French doors. A multitude of paned picture windows and transoms allow abundant natural light to flood the interior spaces, and in turn, reflect the sparkle of night lighting against the beautifully polished hardwood floors. The magic of the house is its floor plan on all three levels which provides for a delightful discovery of intimate spaces juxtaposed to large spaces. The ambience throughout the house is one of great comfort and ease of living and an elegant warm welcome for guests. The inviting GALLERY/FOYER is representative of the impressive craftsmanship found in the detailing throughout. The cozy LIBRARY features a fireplace and handsome tall bookcases. The beautifully proportioned LIVING ROOM with wide bay features a lovely fireplace, side-by-side built-in bookcases and shelves for display of objects d'art. 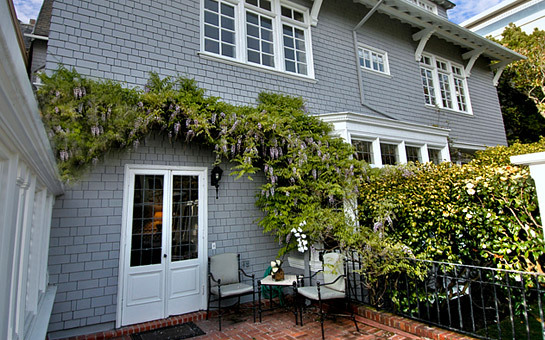 French doors open to the very private, sunny landscaped terrace with brick inlay and trellising. The elegant DINING ROOM seats a very large dinner party. The multi-paned picture window overlooks the rear patio and landscaped garden. The sunny and bright KITCHEN with adjoining FAMILY ROOM overlooking the deck and large gardens is the heart of the house - a warm and generous space for today's inspired style of shared cooking and informal dining. The open family room provides ample seating for relaxation and conversation. French doors open to the spacious deck overlooking the greenery of the Presidio parklands-a perfect place for alfresco dining; stairs access the expansive PATIO & GARDENS. The thoughtfully laid out kitchen has been designed to meet the needs of both family and gourmet cooks. The spacious BUTLER'S PANTRY houses tall cabinets and storage space for all the requirements of large scale entertaining. 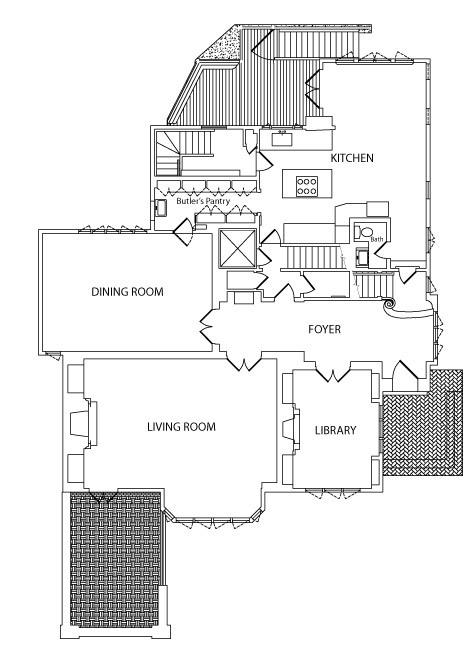 Double guest closets, guest bath & elevator off the foyer complete the main level. Ascend the beautiful staircase to the AT-HOME OFFICES and STUDY. The sunny and spacious double parlor FAMILY/MEDIA ROOM with fireplace is perfect for comfortable family living. The generous space so centrally located is a rare find with study corners & storybook nooks--divided yet together. These rooms make the house sing for those who like space! Ample storage houses media systems and children's toys & games. 2nd LAUNDRY ROOM well located here along with a tiled BATH with tub & shower. GUEST BEDROOM with open SUN ROOM & small balcony overlooks the garden and verdant Presidio parklands with signature Golden Gate Towers in the background. A half bath, storage and elevator stop complete this level. The top floor MASTER SUITE features glorious views of the Golden Gate Bridge, the Bay and verdant Presidio with the ever-changing colors of sea & sky influenced by sunshine & fog. Abundant natural light filters through the triple skylights of the wide dormer and double transoms; the fireplace provides the romantic finishing touch; a wet bar occupies a corner. The luxurious bright MASTER BATH features marble surrounds, double vanities with wide mirror, very large deep soaking tub and glass enclosed shower. The dressing room and closets provide plentiful wardrobe storage. Three south facing children's BEDROOMS with dormer windows and gabled ceilings overlook the pretty tree-lined street; they share a very large marble BATHROOM with tub and shower. An elevator stop and additional storage complete this level. Taxes to be reassessed upon the sale to approximately 1.163% of the purchase price. The spacious downstairs room serves as AU PAIR QUARTERS with built in storage and an adjoining BATH with shower. Additional spaces include a large MUD ROOM, additional STORAGE, plumbing for main LAUNDRY & mechanics for the house. The rear staircase provides inside access between the kitchen on the main level and the two-car tandem GARAGE.